In stock -This product will ship today if ordered within the next 6 hours and 57 minutes. Replaces Valerian & Ashwagandha Formula! 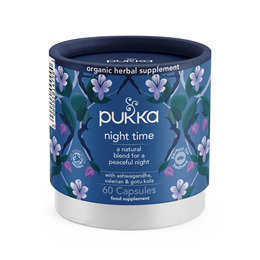 Pukka Night Time is a concentrated blend of some of the world’s finest herbs gathered from fertile organic soils. This broad-spectrum formula contains the highest organic grade, sustainably cultivated herbs, carefully selected to bring you the full potential of nature’s goodness. Pukka Night Time provides symptomatic relief from irregular sleep patterns by settling your hyperactive nervous system. Take 2 vegicaps 1-2 times in the evening with water or Pukka Organic Aloe Vera Juice. Store away from direct sunlight below 30 Degrees Celsius. Below are reviews of Pukka Organic Night Time - Herbal Blend - 60 Vegicaps by bodykind customers. If you have tried this product we'd love to hear what you think so please leave a review. A great herbal sleep product.. would definitely recommend! Great product. They work really well. Don't understand what all the hype is about as they did nothing to help me sleep any better so I would not recommend. I have tried everything now including hypnosis, lavender oil and various herbal tablets to help me get to sleep and nothing works. I purchased these as the reviews were so good but I wish I hadn't bothered. Great product. They work really well. Excellent service from bodykind too. The only sleep supplement that works for me. I would buy them more often (I need them) but wait for 25% discount to come around again. The best herbal sleep supplement that I've tried... I would definitely recommend! I agree with all the previous reviews. Sleeping is a dream! I take these nightly and make sure I never run out! The best ones for me also drink the Night Time tea. These Night Times Vegicaps are the only herbal sleep aids that work for me. I tried them first time when they were on 25% discount offer. 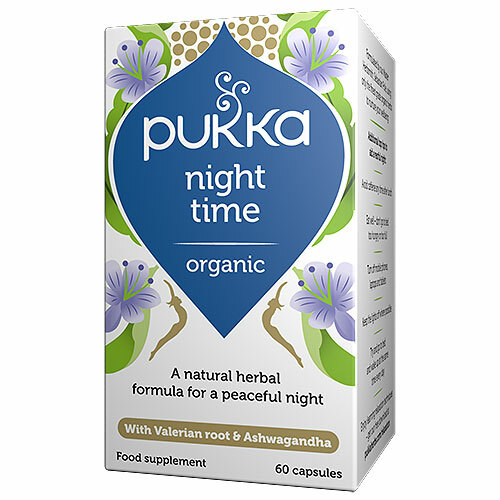 Pukka Night Time is a concentrated blend of some of the world’s finest herbs gathered from fertile organic soils. 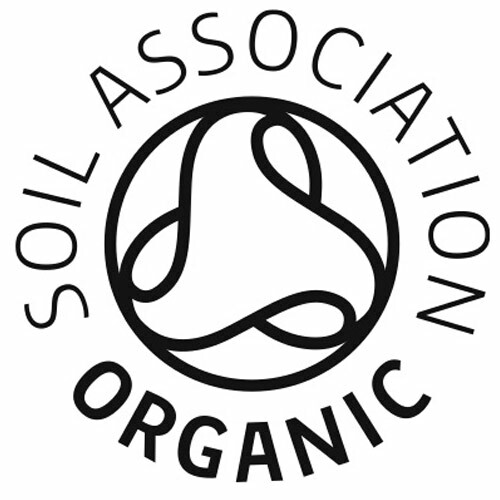 This broad-spectrum formula contains the highest organic grade, sustainably cultivated herbs.